Pickering's Gin is a popular Gin available from 31dover.com in 70cl to buy online. Visit 31dover.com for the best price for 70cl of Pickering's Gin or compare prices on our other Gin products. This marvellously mixed gin is hand crafted at Summerhall Distillery – the first gin distillery to be established in Edinburgh for over 150 years. Edinburgh's first gin distillery for 150 years based on an original Bombay recipe, kept secret since 1947, Pickering’s is a spectacularly smooth and flavoursome gin. Perfect for all social animals. Clean fresh pine derived from the juniper, with citrus notes, Strongly aromatic in the mouth. There are hints of liquorice and cinnamon, slightly nutty notes and a sweet lavender-like softness. Finish: Refreshingly crisp and dry. Where to buy Pickering's Gin ? Pickering's Gin Supermarkets & Stockists. 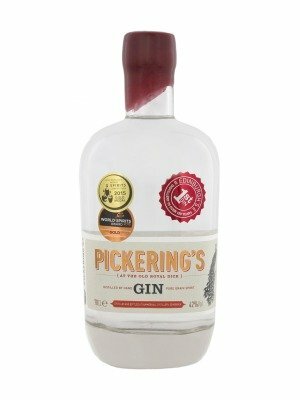 You can buy Pickering's Gin online in most retailers and find it in the Gin aisle in supermarkets but we found the best deals online for Pickering's Gin in 31dover.com, Amazon.co.uk, TheDrinkShop, and others. Compare the current price of Pickering's Gin in 70cl size in the table of offers below. Simply click on the button to order Pickering's Gin online now.